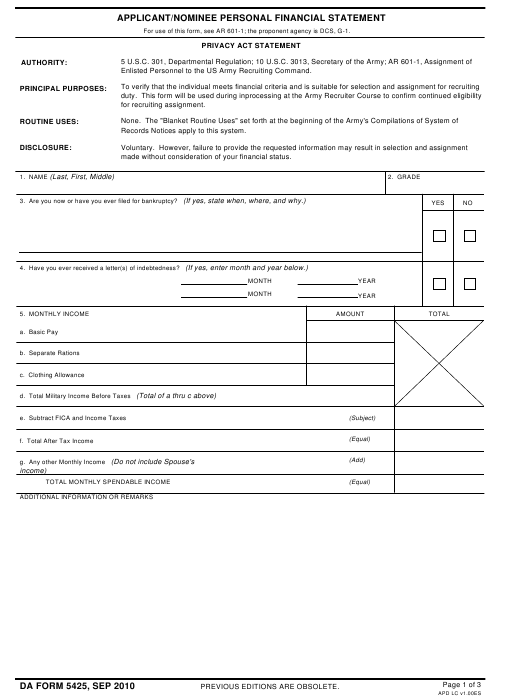 DA Form 5425 - also known as the "Applicant/nominee Personal Financial Statement" - is a United States Military form issued by the Department of the Army. The form - often mistakenly referred to as the DD form 5425 - was last revised on September 1, 2010. Download an up-to-date fillable PDF version of the DA 5425 down below or look it up on the Army Publishing Directorate website. For use of this form, see AR 601-1; the proponent agency is DCS, G-1. Enlisted Personnel to the US Army Recruiting Command. Records Notices apply to this system. made without consideration of your financial status. 3. Are you now or have you ever filed for bankruptcy? 4. Have you ever received a letter(s) of indebtedness? a. Do you have a savings account? b. Do you own stocks, bonds, or benefit from a trust? h. Alimony or child support. i. Any allotments for purposes not listed above? j. Any other indebtedness or financial obligation not listed above?